Successfully Added Double Hamburger Mini Speaker - High Fidelity Edition to your Shopping Cart. Cool new gadget - Double Hamburger Mini Speaker. Are you hungry for good audio? Are you starving for portability and delicious sound at the same time? Cure your hunger with this tasty Double Hamburger Mini Speaker! Unlike the cheap tiny sound you hear from other portable speakers, these high-fidelity Double Hamburger Mini Speakers produce sound way beyond its size. A unique expanding design increases internal resonance and allows for real thumping bass and an incredibly rich dynamic sound. The ideal balance between quality sound and portability is this Double Hamburger Mini Speaker which even comes with a built-in rechargeable battery, letting you take your sound with you on the go! 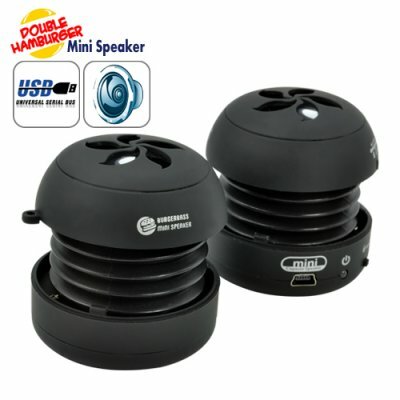 This combination of power and portability makes this Double Hamburger Mini Speaker perfect for all portable devices including iPod, iPhone, laptop, MP3 players, mobile phones, game players. Share your tunes while relaxing outside, vacationing at the beach, driving in the car, hanging out with friends at school or at the mall, or even relaxing at home and in the office. Looking for a tasty item for resale? Hurry up and place your order right now before it runs out. Get a couple to enjoy for yourself and your family, or order in bulk to make a nice profit on your internet storefront. Whatever the reason is, you simply cannot go wrong with our 100% wholesale price and 24 hour express shipping service. Only available from the leader in wholesale electronics - Chinavasion. This great product is available with no MOQ (minimum order quantity) for a limited time only. After 60 days, it will only be available with a MOQ of 4 units, so be sure to order your samples right away! Standard 3.5mm audio plug, use with mobile phones, music players, game players, etc. Compact travel speaker with big sound! What does High Fidelity mean? From Wikipedia: High fidelity is a term used by home stereo listeners and home audio enthusiasts to refer to high-quality reproduction of sound or images, to distinguish it from the poorer quality sound produced by inexpensive audio equipment. Does the Double Hamburger Mini Speaker always have to be connected to a USB port? How loud is the Hamburger Mini Speaker? The Hamburger Mini Speaker is loud enough to provide full sound to small/medium-sized rooms. In terms of value for money, the Hamburger Mini Speaker beats the X-Mini 11 times out of 10. Don't take our word for it, look for "Hamburger Mini Speaker", "Burgerbass Mini Speaker", "Bassburger", and "Mushroom Mini Speaker" on popular forums to read real testimonials from enthusiastic customers. Can I eat it when I'm done listening to my music? No. It is not edible. The "hamburger" in the name simply refers to the shape.